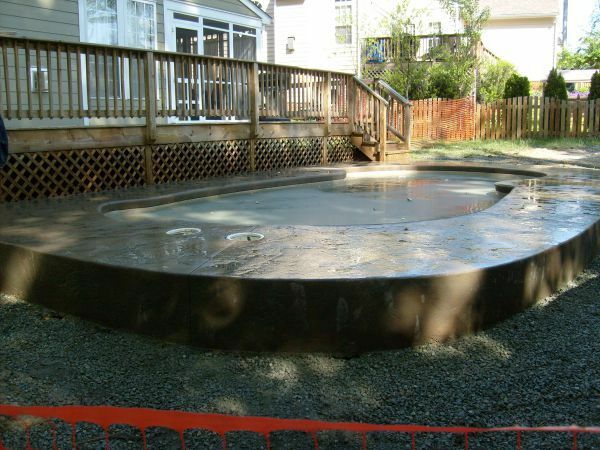 7 Deadly Sins of Fiberglass Pool Installations! My life in the pool industry began at age 15 as a humble laborer in a small family owned pool business. The term “green-horn” doesn’t even begin to describe my naiveté at the time. I realized I had a lot to learn when one day, on an above-ground pool installation, my boss sent me to find the “wall stretcher” behind the seat of the truck. I returned after thirty minutes of tearing the truck apart looking for the thing to find my two comrades rolling on the ground with laughter. It was then I realized the stupid tool didn’t even exist. Well, some things never change; I still have a lot to learn. But since my partners and I started River Pools and Spas in 2001, we have added over 1,000 inground fiberglass pool customers to our reference list. One thing’s for sure: we’ve seen plenty of the good, the bad, and the ugly of fiberglass pool installations. I can honestly say that if it’s possible to make a mistake with a fiberglass pool we have probably done it, or at least seen it. 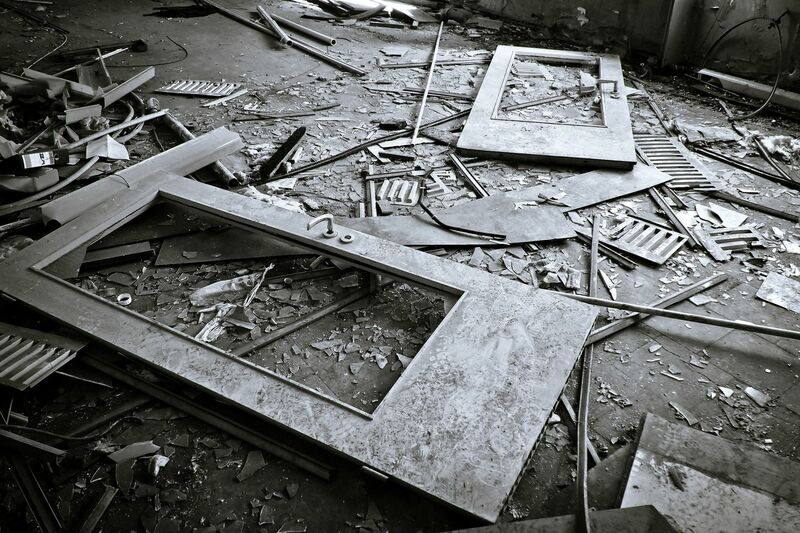 The title of this article uses the term “sins” to describe some of the common installation methods many contractors use that are downright flawed or at least have room for significant improvement. We have committed each one of these "sins" ourselves. I consider them "deadly" in the sense that they have cost us tens of thousands of dollars and huge amounts of stress on ourselves and our wonderful customers. As we have evolved through the years, we have consistently been humbled by our mistakes and chose to repent and changed our "sinful" ways. However, I don’t profess what we teach is "doctrine." Educate the new or less-experienced fiberglass pool installer so they don't make the same costly mistakes we have made. Empower the consumer with the information they need to ensure they get a quality product. It doesn't matter how well the pool is installed—if the contractor does a poor job on the cantilevered coping, the entire project looks bad. We had a rude awakening when we poured cantilevered concrete coping on our first fiberglass pool. Our concrete guy had been doing concrete for over 30 years and had poured literally tens of thousands of yards of concrete. We felt confident enough…until we started pouring the concrete and found that the cantilevered forms were not holding. We scrambled and managed to secure everything and thought we were out of the woods…until the nightmare continued when we stripped the cantilevered forms the next day. The surface of the coping was supposed to be clean and smooth. It looked more like chunky oatmeal. We managed to make it right, but it has taken us many, many concrete pours to get to a point where we have mastered the art of cantilevered coping. Because cantilevered forms are made of Styrofoam, it can be difficult to install them so they're secure enough to withstand the weight of the concrete. If installed improperly, they tend to bow or completely blow out. Keeping them straight on a straight wall pool can be tricky. Tight corners can also be difficult to form. The key is to use tape to help with bends and use twice as many ties as the form manufacturer recommends. Installing the forms so they are secure is only the first step. To ensure that the final coping surface is clean and smooth, you have to remove air bubbles and bring the cream of the concrete to the face of the form. Do this by tapping the outside of the form, causing the concrete to vibrate. For more information about the importance of cantilevered coping, check out our other article on the topic: Why is Pouring Concrete Coping Around a Fiberglass Pool So Difficult? If you study theology at all, you know that there are two types of sins: sins of commission and of omission. This one is one is a sin of omission. Several preventative measures should be taken during the initial installation of the pool. They can save contractors and customers alike significant heartache down the road. A dewatering system is one of these measures. A pool installer that does not install one on every pool either doesn’t understand their importance or is suffering from a serious case of short-term thinking. A dewatering system provides a means to remove the ground or surface water around the outside of the pool in the event that the pool has a leak or has to be drained. Hydrostatic pressure refers to the force that the ground water exerts on the pool shell. Removing the ground water outside the pool is critical. If this is not done and there is more water outside of the pool than inside, the hydrostatic pressure can reach a point where it can damage the pool. Granted, most fiberglass pools will not have a leak or need to be drained within the first twenty or thirty years of its life. But regardless of the manufacturer or installer, a certain percentage will require draining for various reasons soon after installation, and all will eventually have to be drained, even if it’s fifty years from now. We install a very simple and inexpensive dewatering system on every pool regardless of soil condition or location. We take an 8” PVC pipe about 6–8 feet long and drop it down to the bottom of the excavation outside of the deep end of the pool after it has been set. The bottom of the pipe is at the deepest part of the excavation, and the top extends above the top of the pool. We then encase the pipe in gravel as we backfill the pool. When it’s time for concrete, we cut the top of the pipe off flush with the top of the deck and cover it with a skimmer lid. That’s it. Instant access to ground water. And if the pool needs to be drained? Simply remove the skimmer lid, drop a pump down the pipe, and pump the groundwater out. This costs less than $100 per pool and frankly is a step that a pool contractor can’t afford to miss. This is a critical step to plumbing any pool. The obvious purpose is to find any leaks before the pool deck is installed. No one is perfect, and the truth is that the folks plumbing the pool sometimes make mistakes. Plumbing materials can even be defective. Leaks are going to happen. It’s easier on everyone to find and fix them before the patio is poured. Fiberglass pool installers should employ some means to ensure the plumbing around the pool doesn’t settle over time. At River Pools, we drill holes in the top of the pool shell and tie the plumbing up with cable. We've found this to be quick, cheap, and effective. It also allows us to pre-plumb the pools before we set them in the hole. If this isn't done, there is a significant risk that the plumbing will settle over time, putting pressure on the fittings in the pool. This is especially the case when the base/backfill material is sand, as you will see later. Two types of PVC pipe are used on inground pools today: rigid PVC and flexible PVC. I question why flexible PVC is still widely used throughout the industry despite the fact that manufacturers of the pipe clearly state that it is not suitable for underground use. Rigid PVC is superior in terms of strength and durability. However, it takes longer to install. We have found that heat-bending rigid PVC is the most effective means to plumb fiberglass pools. It allows the pipe to form to the contour of the pool while maintaining the benefits of rigid pipe. This is another topic we have discussed in detail in previous articles. Despite the fact that sand is accepted industry-wide as the material of choice, there are several inherent disadvantages to using sand as a base and backfill material as opposed to gravel. These disadvantages are consequences of a single property of sand: It liquefies when saturated with water. A liquid base is a poor foundation for anything. 1. A liquid base is a poor foundation for anything. As my partner Marcus eloquently pointed out in his article on the topic, "the foolish man built his house upon the sand." Pools installed on a saturated sand base will sometimes settle. This is normally during the process of filling the pool with water—the initial weight of the water displaces the sand under the pool. Granted, in an ideal world, the sand under the pool would never be saturated with water. However, in the real world, it does become saturated from groundwater conditions, rain during the install, surface water running into the excavation, etc. If this happens and the pool does actually settle, the installer has to make a call whether it’s severe enough to empty the pool and re-set it, which takes a ton of time. I don’t want to have to make that call, and I don’t want someone who’s on a tight schedule making that call in my backyard either. Clean crushed gravel is the perfect base for a fiberglass pool because as long as the soil under the base is solid the pool will never move…hence the enduring success of the "wise man’s" house. In principle, this one is simple. 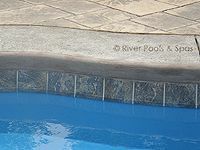 When sand is used as a backfill material around the pool in an area that does not have sandy soil, a 12"–24" column of sand rests on the side of the pool. When that sand becomes saturated with water and liquefies, it exerts a tremendous load on the side wall of the pool and bulges the wall. Now, this only happens to a certain percentage of pools because it takes a combination of all of the wrong conditions, but it does occur! Clean crushed gravel is the ideal backfill material because its properties do not change when saturated with water. It performs the same wet or dry, and the point-on-point friction of the gravel allows it to hold its form. Pea gravel is another backfill material commonly used. It is superior to sand because it doesn’t liquefy, but doesn’t hold as well on the side walls of the pool because the little round stones are act like ball bearings. In a perfect world, the sand backfill around the pool will be 100% compacted as the pool is installed. However, I would submit that this is next to impossible. Every time I have seen a pool backfilled with sand, a year or more down the road the sand has settled 6 to 18 inches. This has no direct impact on the pool shell, but it puts a tremendous downward pressure on the plumbing that’s encased in the sand material. This manifests itself in the way of leaky fittings in the pool. As the plumbing is pulled down, it takes the thru-wall fittings with it. Leaks start at the bottom of the fitting as it becomes cocked and is pulled away from the wall of the pool. If enough pressure is exerted on the plumbing, the inside of the fitting will actually crack open and even eventually break off. This predominantly happens with return and light fittings but can happen at any point a fitting goes through the wall of the pool. The astonishing thing is that a pool can be installed 100% according to industry standards and manufacturer specs and this problem can still occur. The answer, once again is gravel backfill. Why? Because it compacts on placement and simply doesn’t settle. Once it’s in the hole, it doesn’t move…and neither does the plumbing. For obvious reasons, we are huge proponents of clean crushed gravel as a base and backfill material and feel that it is the only material that performs acceptably in any condition. One of the great advantages of many fiberglass pool models is their majestic steps and bench areas. However, because of the inherent flexibility of fiberglass, we must take measures to ensure these steps and benches remain level. If the proper steps aren’t taken, these areas will tend to sag, and once the patio is placed around the pool there’s no turning back. We have found two methods of solidifying these areas to ensure they look great. With a long set of steps you can actually dig out from underneath the top step before pouring concrete and jack the steps up level and brace them, being careful to distribute the weight across the step and not at one point. Pour concrete in the area under the steps to ensure they will never move again. 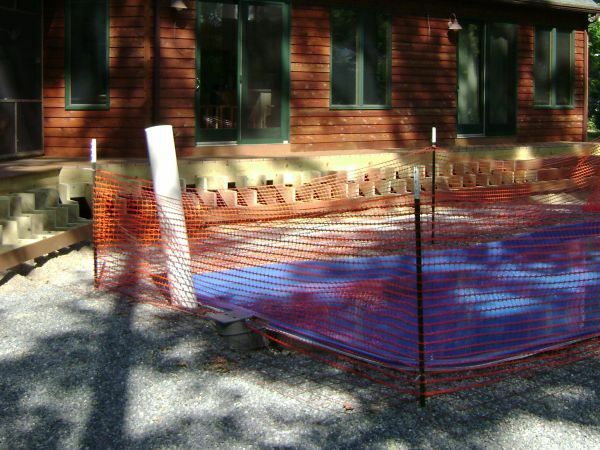 A better method is to use CMU block to brace steps and benches during the initial installation of the pool. This will ensure that they will never move and gets the steps and benches perfect from jump. 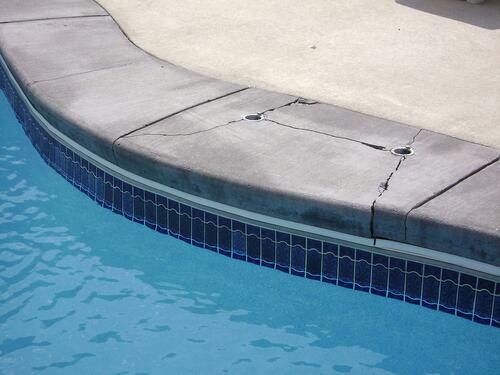 Another common problem that occurs on straight-wall pools is that the walls will bow in or out. The key is to run a string line from corner to corner of the pool and constantly monitor the walls during the backfill process. Use the pressure of the water inside the pool or the backfill material outside the pool to achieve a perfectly straight wall. There is no such thing as a perfectly level yard. One of the most challenging aspects of many projects is finding a way to manage the slope of a given site. It seems like common sense, right? You have a downhill side of the pool that needs to come up 30 inches and you have this huge pile of dirt just sitting there; why not just use that? The soil hasn’t been tested and probably isn’t a suitable base for a patio. If the soil is good, it’s very, very difficult to compact the soil to an acceptable level. Based on our experience, there’s a significant chance it’s going to settle and cause problems down the road. Keep in mind that down the road is 3 to 5 years, long after our workmanship warranty has expired. But we don’t build pools to last a couple years; we build them to last a lifetime. The problem is that not every customer can afford to build a retaining wall. So what’s the solution? The solution is what we call the turn-down slab. We have our concrete return to ground level, wherever that is, so we are essentially pouring a concrete wall. If the yard is 20 inches low on the side away from the house, there’s 20 inches of concrete being poured there. We either leave the wall exposed or backfill against it to conceal it. This is a win-win for everyone. We can sleep at night knowing we’ve installed a quality product, and the customer is only charged our cost of labor and materials and they have a pool deck that will never move from settlement…guaranteed! In my opinion, the only way to properly set and level a fiberglass pool is to ensure the pool is right upon the initial set, and not to manipulate the level of the pool while it sits in the hole. We have not had long-term success using the method of raising the pool to the desired level and introducing material under the pool to maintain that level. There’s nothing more frustrating to a fiberglass pool installer than to spend hours and hours lifting and re-setting a pool in an attempt to get it level. However, we have found that this initial investment of time is well worth the sacrifice considering that the pool is resting in an unaltered state on a solid foundation. Want to learn more about the best ways to install a fiberglass pool? Well, there you have it! 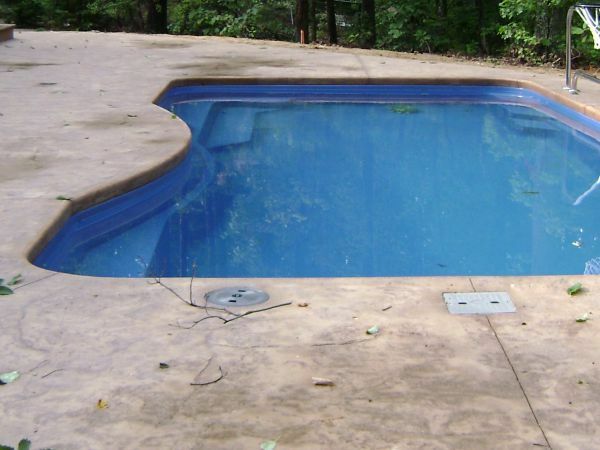 The 7 deadly sins of fiberglass pool installations. As I stated earlier, this is simply a list of lessons we’ve learned based on our experience of installing well over 600 fiberglass pools. It must be noted that a pool contractor can completely ignore each and every one of these and still install a fiberglass pool that meets industry standards. These standards exist to ensure that every pool meets a minimum requirement. At River Pools and Spas we have never been content with a minimum level of performance; in fact we are never content with our own level of performance. There is always room for improvement. There is always a way to make our systems, process, and products better. I’m sure that ten years from now this list will have changed and certain things that we are currently doing will be deemed “sinful,” but until then we’ll be doing our best to stay on the straight and narrow. Thanks for reading! As always, be sure to chime in with your thoughts on the matter, and be sure to subscribe to our blog before leaving the site. Editor's note: This blog article was updated on October 26, 2018.